Natural tatami mats in rice and rush straw represent the true essence of authentic japanese interior design. The high quality that distinguishes our tatamis is visible in their double weave and thickness of 5,5 cm. These mats can be used to create oriental style floorings or as bed bases in japanese style beds. A tatami is in fact an ideal base for japanese futons as the firm support this combination offers ensures a healthy sleep. Tatamis are traditional mats, used in Japan as floor coverings that create a comfortable and soft to the touch area. Our high-quality tatamis can also be used as mattress supports in our beds and for our Japanese Bed Platforms. High-quality Japanese tatamis made of woven rice straw. Our tatami-mats stand out for their double weave present both on the front as well as the back side of the mats. They make a perfect base for any mattress in all our beds and can be combined to create stunning floorings. With our foldable mats, you can take the comfort and style of a japanese Tatami wherever you go! Our foldable tatamis can be folded in 4 parts and easily carried around thanks to their practical bag with handles included in the price. These Tatamis are perfect to practice sport, martial arts or meditation in gyms and parks, or even on the beach. Composition of High Quality Japanese tatami made up of woven straw on both sides. 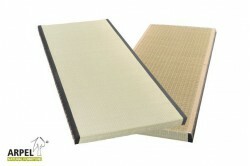 The composition consists of 4 180x90 cm tatami mats and one 90x90 cm tatami mat.